Lublin is the capital of Lublin Voivodship, a city with a long multicultural tradition and a rich history - dating back to the year 1228. 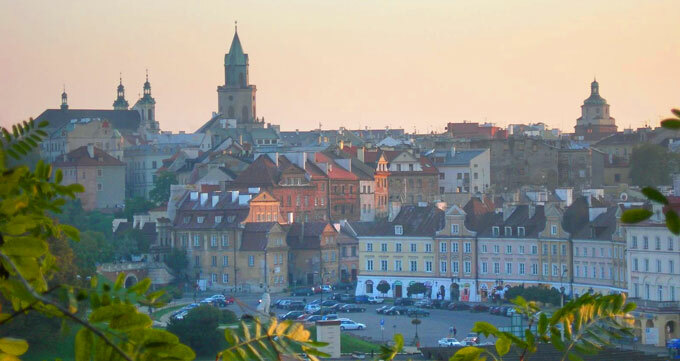 Owing to its location near the European Union’s eastern border with Ukraine and Belarus, Lublin is an important centre for both international and economic relations. It is also one of the largest academic centres in Poland with five universities, and several private higher schools as well as public research institutes. Over 5500 foreign students from nearly 100 countries study in Lublin. A large part of them have chosen to study medicine. Students represent a significant part of Lublin’s population and this is reflected in its unique atmosphere. Student Culture Days is a series of events: concerts and accompanying activities that last all May. Annually organized large festivals and cultural events such as the Night of Culture, the Magicians’ Carnival, the Jagiellonian Fair, and the European Festival of Taste attract audiences from different parts of Poland as well as from abroad. Lublin Voivodship has numerous national and landscape parks and tourist infrastructure which includes a well-developed network of bicycle paths and places full of still unspoiled and pure nature. As a result, active forms of leisure are encouraged. Ecology, with particular emphasis on food and agriculture is one of the strategic priorities of the region.